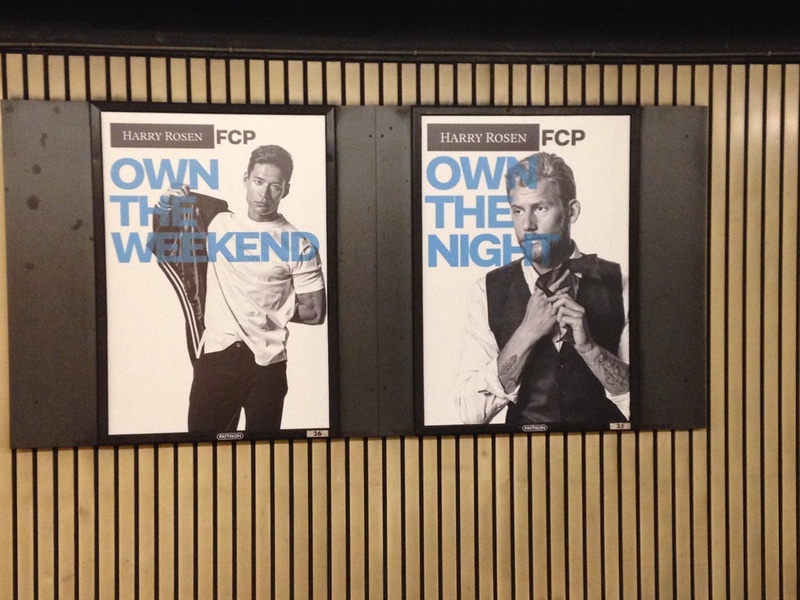 Spotted in a Toronto subway station: These billboards for Harry Rosen, the elite Canadian men’s clothing store. I was intrigued by the no-holds-barred equation of masculinity, sexuality, physicality, money, and ownership. Also, these men “own” the “night” and the “weekend,” not traditional work times, but of course, presumably these hours extend (and are made possible by) their “ownership” of the daytime. This ad also reflects constantly shifting norms for male beauty, including a multi-racial man and a man with heavily tattooed arms who appears a model of business suave—his arm decoration enhancing rather than detracting from the power and success he represents. These men suggest progress in representations of ideal masculinity but yet of course, maintain the norm that it is beauty—however defined—that means success. And though different men may step on to this stage, they play the same parts when it comes to notions of masculine power. Harry Rosen’s models may be objectified, as targets of a gaze, but, they “own” their surroundings in traditional masculine style.